In a cunning move, Amazon is selling Lady Gaga’s new album for 99 cents, and giving the people who download it free access to its cloud-based music locker. Your move, Apple. Lady Gaga is hot property in terms of brand promotion, meaning Amazon’s pulled off a huge coup: It’s offering her new album for just $0.99. As part of the deal, you get free access to 20GB of Amazon’s new (unlicensed?) cloud music locker–a service that normally costs $20 per year. 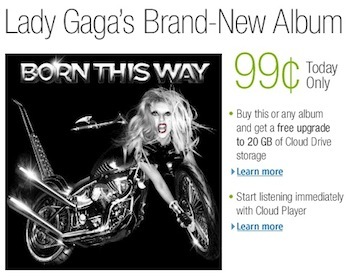 Today’s Daily Deal is actually carefully tailored to tempt Amazon music buyers, even if they’re still wary of the attractions of cloud technology: If you buy Born This Way for less than a buck (which is a helluva bargain compared to Apple‘s $11.99 price), can upgrade your cloud music system to store most of your music collection, probably, free in the cloud locker for a year. Amazon has bundled 5GB of storage for free into its Cloud Music system, leveraging its huge data-warehousing facilities–the free offer upgrades this to 20GB. And this move to entice new users is all about getting to them before Apple launches its (presumably) upcoming cloud-based iTunes–possibly called iCloud. The timing of this attempt can’t be interpreted as anything else, really, and it’s an indication that the battle for cloud-music supremacy is so on. Meanwhile, Lady Gaga has also teamed up with Google to promote its new Cloud Music system, via a commercial for Google Chrome. Tempting as these tricks are, whether they’ll work or not remains TBD. 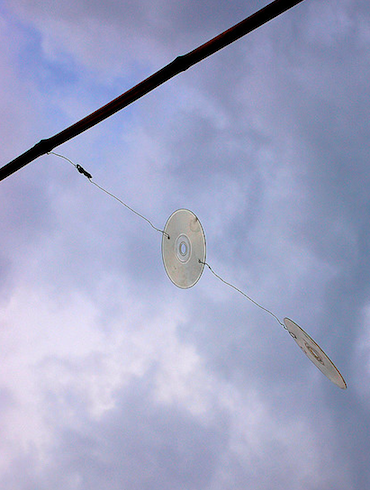 Amazon may snag a new cloud-system audience that’ll spend hours uploading the many gigabytes of their MP3 collections to its servers. But the system is free, and apparently was launched without the approval of the big record labels, which casts a shadow on its long-term lifespan, and reminds us that users who wish to “quit” inside the first year haven’t got anything to lose. If Apple launches its new system soon, even with a low yearly fee, it’ll surely tempt many Amazon users to switch back, since it’s the industry leader. Meanwhile, since Apple has label approval, it may be able to use a centralized song repository, meaning users won’t have to bother uploading their collections to yet another cloud service. We’d heard that Apple is close to signing all the major labels to its iCloud system, possibly concluding deals this week. Amazon certainly seems to think a deal is imminent, and is using Gaga to grab some of the music-cloud limelight before Apple hogs it all.